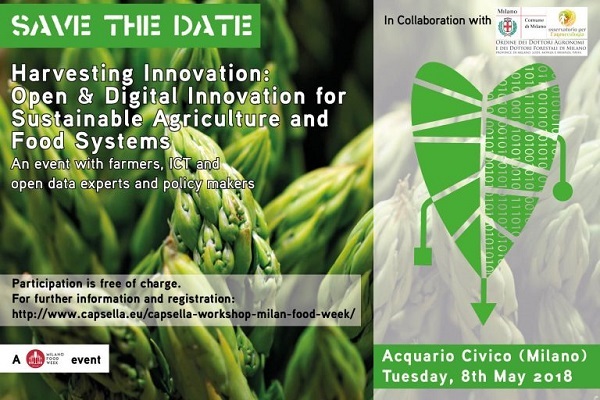 It will be an opportunity for participants to hear from Europe’s most creative scientists in open data and agriculture, food professionals, farmers, researchers, ICT and open data experts that will exchange experiences and case studies. Participants will be able to test and see the latest apps and prototypes created by open innovation and co-design such as the new SOILapp and the Storytelling app and theSchool meal app recently launched with the patronage of Milan Municipality and Asti Municipality, two leading cities in Italy keen about their citizens healthy diets. 5 - 8 November 2018 : SciDataCon 2018 : The Digital Frontiers of Global Science - part of International Data Week (Gaborone, Botswana) Now accepting submission for paper abstracts and posters!